Happy New Year to all, may all our resolves be kept and our wishes come true. I know 2015 will be better than last year, only because there is no election in the Nation’s capital. It is a great honor to welcome Litchfield Grange No. 107 back as a reorganized Grange. My special thanks to those 13 members who have committed themselves in the reorganization of this Grange. Now it’s time for all of us to go and visit these Grangers and help in any way to help them grow and feel welcomed. I wish to thank Todd Gelineau for helping them with the reorganization process and as staying on as Mentor and to Overseer George Russell for presenting Litchfield Grange their Charter. Good luck Litchfield Grange! It has been a pleasure to visit with our Community Granges since becoming State Master, I have been invited to give fifty year certificates and seals to our Grangers. It is an honor to visit and talk to these members about their experiences with the Grange, even if they no longer attend meetings, their knowledge and retention of Grange ritual are amazing. These members have invaluable lessons to teach newer members, whether about the Grange itself or local history, even about local people within the community. This is what makes the Grange vital to our State, just the local history our members can tell, something historian Ken Burns should look into. By the time this issue is out we will have come back from the Northeast Leaders Conference in New Hampshire. I hope that our team will be involved and informed as to the activities in the Northeast. Our Pink Sash Family is almost completed. 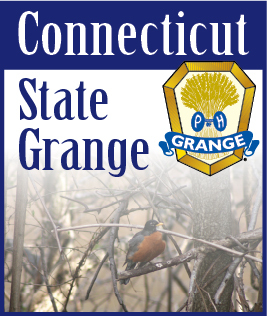 I wish to thank those new members that have joined us and hope that we all will work hard to represent the Connecticut State Grange forward and upward. Just a note, there are some pink sashes that have not been returned to the State Office since October. If you have a sash or a Deputy Handbook, please call to make arrangements to get these items back to us. Thank you. These past few years new members have received the Welcome Ceremony or the Obligation Ceremony. It is imperative that you must witness the first four degrees, so that you may observe the ritual and lessons that these degrees offer to better understand the works of the Grange. East Central Pomona #3 and New London County Pomona #6 are committing themselves to presenting a Degree Day in March and April. Please contact the Masters to make arrangements to witness these degrees. It is not painful and might be fun, they may even feed you! But now I challenge other Pomona Granges to pool your resources and put on a Degree Day in your area or offer help to others. Without the lessons of the lower Degrees we cannot be effective in our works as Husbandmen and Matrons. On December 14th East Central Pomona gave Marcia and me a reception at Glastonbury Grange Hall. I was honored by the turnout of people to express their good will to Marcia and me, from family and close friends to Grangers throughout the State to wish us well. It proved to me that there is harmony in the Grange. So I thank all that attended and gave us token gifts of good luck. And I wish to thank all that contributed to the feast, I’m still eating cake. Lastly, people have been asking about a Pink Sash meeting. Yes, we will schedule a Pink Sash Meeting for Sunday, Feb. 1, 2015. The Deputy meeting will be at Noon and the Committees, Chairmen and members’ meeting will be at 2:00 P.M. I hope that all can attend. This is just a reminder that the National Digest states that a Subordinate Grange will hold one regular meeting a MONTH. With winter weather I hope that every attempt will be made to meet this requirement. Member safety is our primary concern so please take the appropriate actions to meet this goal. Have a safe winter. Noel.